SMS athletes hit the ground running in 2019 with many of our winter sports already underway! The St. Margaret’s Swim Team has been practicing every Tuesday since late November. The team has worked hard to strengthen their swim skills in preparation for their first meet on Monday, February 4th at Saanich Commonwealth Pool for the VISAA Championships. Stay tuned for big things from this determined squad. It is another exciting year for volleyball at St. Margaret’s. Once again, an enthusiastic group of Grade 6-8’s came to make for two teams in the middle school league. The teams have already hosted their first jamboree. The new triple-ball format has made for lots of close games and exciting rallies. Coach Cheveldayoff and Coach Emma are excited to see the team develop over the next four weeks. Want to catch some volleyball action? SMS hosts again on Wednesday, February 27th in the South Gym. 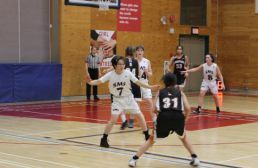 The Jr Girls Basketball Team had a rewarding season post winter-break. Despite many athletes new to the sport, the team finished the season strong, bettering their season high score in each of their last four games. Team highlights included hosting the Jr. Girls ISA Basketball Tournament on home soil. This tournament saw eight ISABC schools from Vancouver Island and the Lower Mainland in attendance. The team was instrumental in the organization and facilitation of the event, taking on roles in scorekeeping and timekeeping. It was a great learning opportunity for everyone involved. January’s monthly value is Perseverance. The Sr Basketball Team has embodied this value to their core. Returning from the winter break, the team has faced injury, illness and fatigue. Even playing short-handed (3 v. 5) in some instances, this team has shown grit in the face of adversity. Despite all the pitfalls of the season, they have bonded together in those moments to show-up for one-another. The team plays their final game of the regular season on Monday, February 4th, come cheer them on. St. Margaret’s student-athletes entering Grade 9-12 may be interested in the following exciting opportunities. Our student-centred approach allows for flexible timetabling in support of such as the Canadian Sport School. The Canadian Sport School Victoria (CSS) is looking for Canada’s future Olympians, Paralympians and National Team members. CSS helps to balance the demands of pursuing excellence in the classroom, in sport and in the community. We support hardworking, intrinsically motivated student-athletes who are driven to represent Canada at an elite international level.